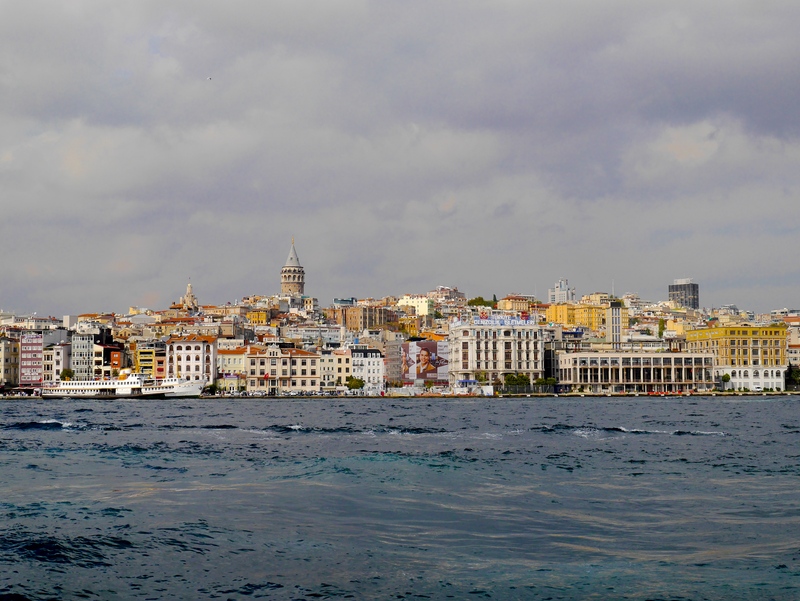 Istanbul is the gateway to Asia, while at the same time embraces Europe on the other hand. It is a unique city that has been a capital to many different civilisations thousands of years ago, from past to present, and till today, it is home to people from all over the world. It is a city that dates back to 300 thousands years ago, showcasing a myriad of cultures, religions and civilisations combined. Every corner of Istanbul is filled with surprises, and you are bound to find something that has historic value. 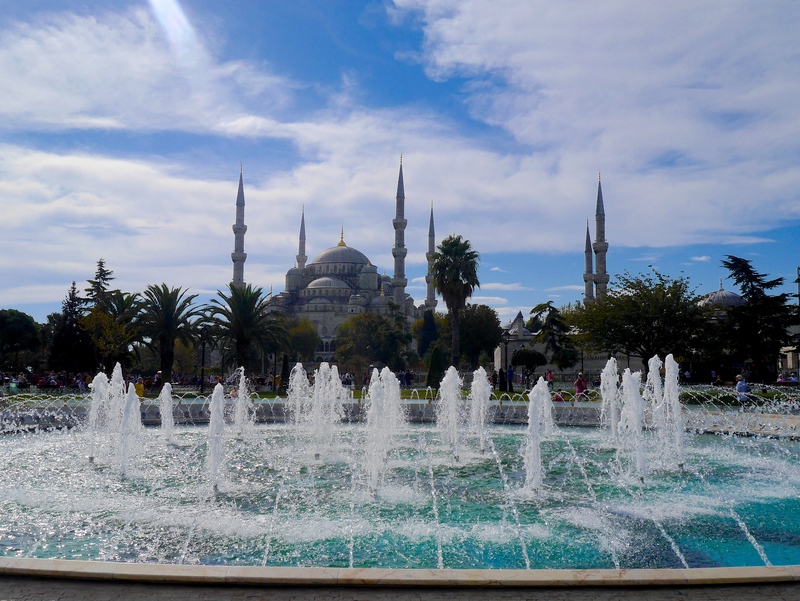 Probably the most unique and eye-catching attraction in Istanbul is the Blue Mosque. It was one of the largest structures that I saw when I looked at the city center from a distance. This mosque is named after the Ottoman Sultan, Ahmet I, who ascended the throne at age 14. He was only 19 when he commissioned to build this great mosque. he showed dedication to the building of the mosque by being a labourer himself. The construction took about 7.5 years between 1609-1616. When the amount of construction work, the interior design and decoration of the mosque, and the technology available during that time, it is considered a short amount of time. 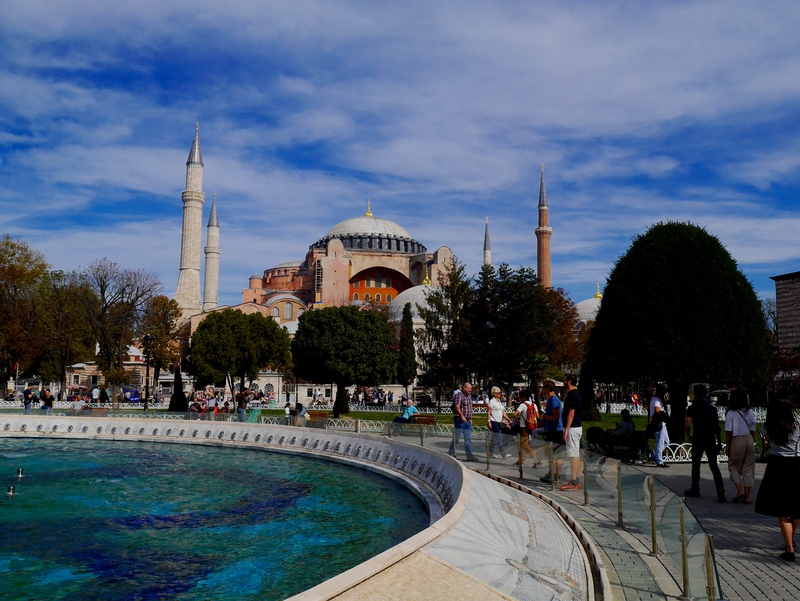 The Sultanahmet Mosque was never called Blue Mosque. 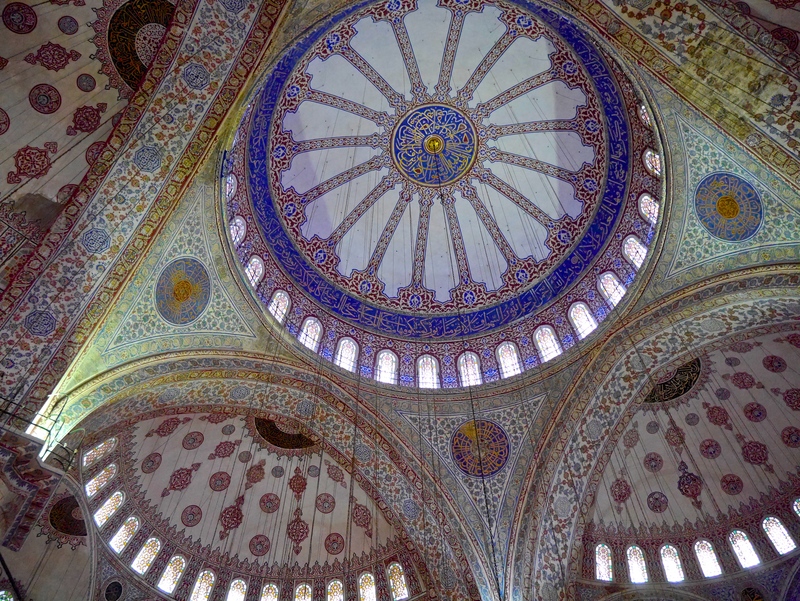 It was only called by Western visitors because of the famous blue tiles that adorn the interior walls of the mosque. There are more than 21 000 in number. The beautiful decoration inside the prayer hall and the light from windows give a felling of serenity. Inside the mosque there are 4 very large pillars with a diameter of 5 meters. These are given the name ‘fil paye’ in Turkish which means ‘elephant feel’ due to the resemblance to the sturdy feet of a huge elephant. 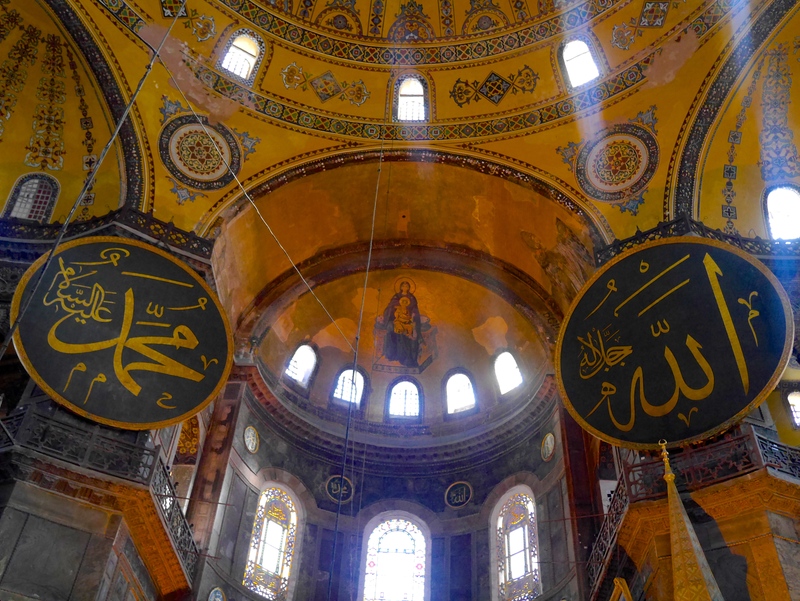 Hagia Sophia, on the other hand, is an important monument for both Byzantine and Ottoman Empires. It was once Constantine’s Church, before it was converted into Hagia Sophia Mosque, and today it is called hagia Sophia Museum. Istanbul today carries characteristics of both the Byzantium and Ottoman Empires cultures which are 2 totally different cultures. Thus Hagia Sohia is a perfect synthesis where visitors can understand and observe the differences coming together as one under a great dome. 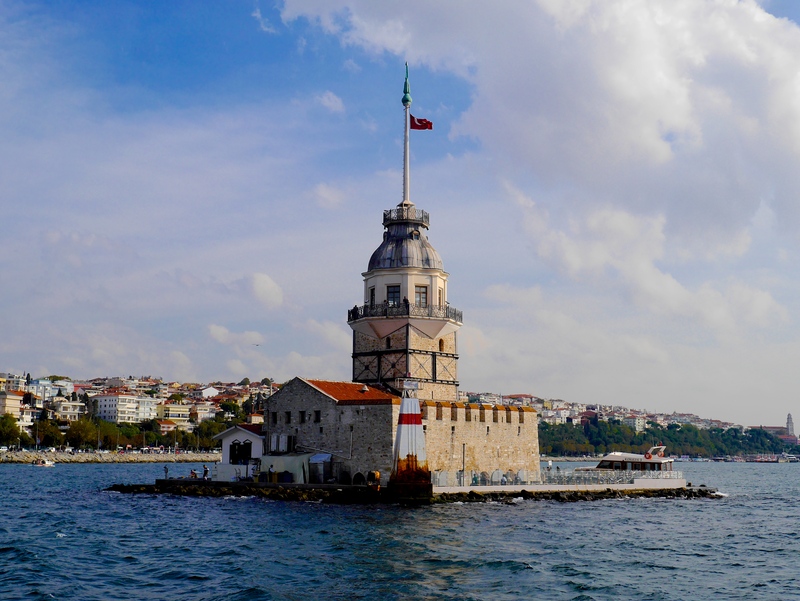 My friends and I also took the Bosphorus Cruise, which brought us along the Bosphorus, or Istanbul Strait separating the European continent and Asia. 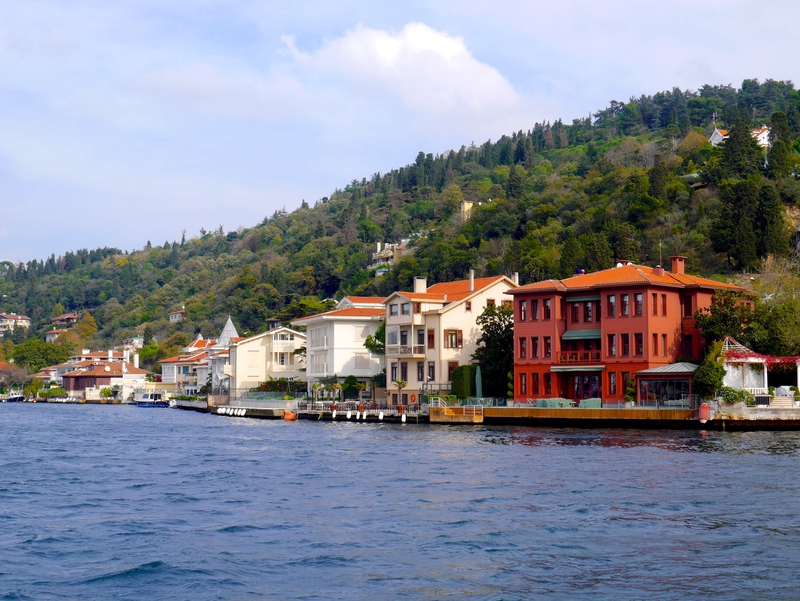 We took the short circle Bosphorus Cruise, and was amazed by the wonderful sights that greeted us along the way. It is such much more than just a body of water, as this strait has been coveted for its strategic location throughout Istanbul’s history. Some of the world’s most interesting cultures have claimed this place home for centuries, as its sprawling shores and seas made Istanbul look so inviting even on a dull rainy day. We managed to catch the sights of Dolmabahce Palace, Leanders Tower, two suspension bridges (Faith Bridge and Galata Bridge), Rumeli Hisarı Fortress, beautiful mansions by the shores of Bosphorus. On the last day, we visited Taksim Square, known as the modern city center of Istanbul. 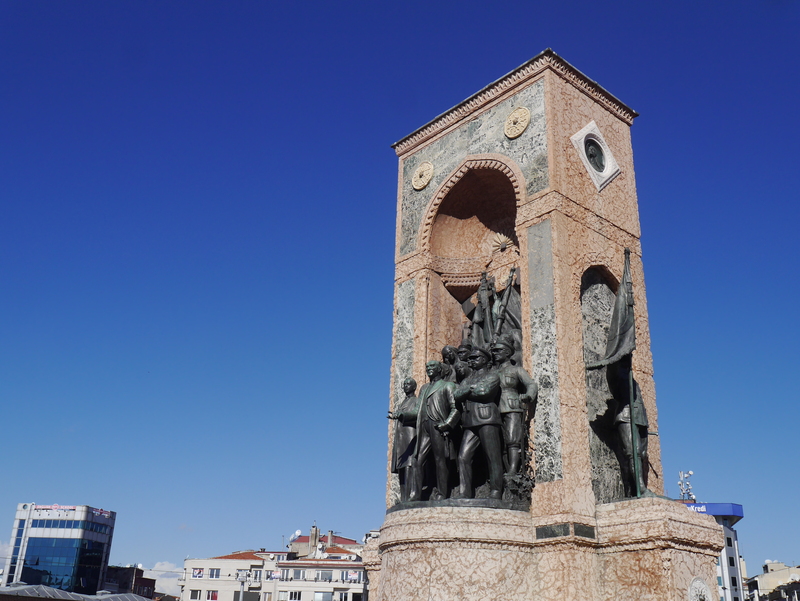 The monument in the center of the square is the Independence Monument, which opened in 1928 and describes Atatürk, founder of the Republic, as a military commander-in-chief and a statesman. It is now the spot of official ceremonies in Istanbul, as well as deadly riots and protests that has been rocking Istanbul for years, and recently, especially when I was traveling in Istanbul, due to protests regarding ISIS and the Syrian refugees. It was my first time noticing so many beggars and refugees on the streets of any particular city. These refugees have been pouring into Turkey and Istanbul ever since ISIS takes control of border Syrian towns near the Turkish border and Iraq. Overall, Istanbul is an intriguing city, as it is very different from most European cities, but yet has many European and Western influences. It is a very religious country, although it is a secular state, and the Turkish were very friendly towards us during our entire time spent in Istanbul. Istanbul brought new insights and opened a whole new world for me. It is a city of contrasts, a city bustling with life, abundant with cultures and history.